The Netherlands has always had a contentious relationship with water. Once a thriving sea-faring nation, the country was also regularly subjected to flooding. The island of IJsselmonde, in the province of South Holland, was shaped and reshaped by several rivers flowing around it, or sometimes even through it. Early inhabitants of the island already started to build dykes to protect their land. One of those dykes was called the Hordijk (“dijk” = dyke). This name most likely stems from the Dutch word “horden”, which refers to the woven wooden mats that were used to fortify these dykes. A detailed history of the island of IJsselmonde (in Dutch) mentions the Hordijk in the context of a flooding that happened in 1446, so it must already have existed even earlier. In a subsequent agreement between several municipalities about the maintenance of the various dykes on the island, the Hordijk was explicitly mentioned, written in old Dutch as “hortdijcx”. 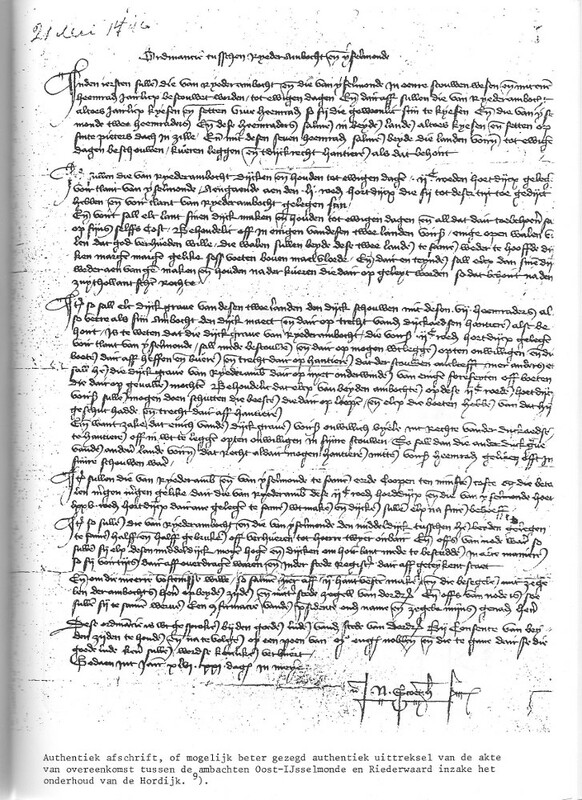 A copy of the agreement about the maintenance of dykes on the island of IJsselmonde, from 1446. Source: L. W. Hordijk, Brielle. 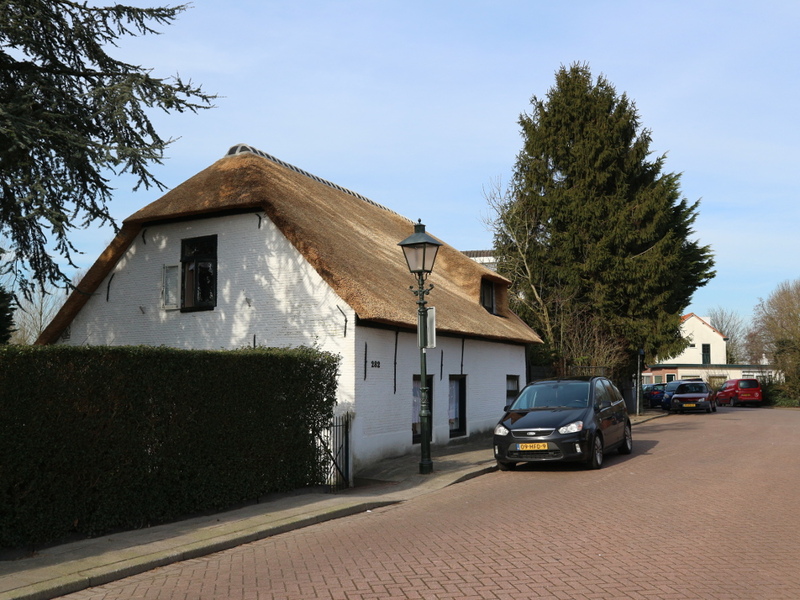 In the document “Geschiedenis en genealogie van de families Hordijk” (view a summary), L. W. Hordijk describes how some families living along the Hordijk started using this name as their family name. As a consequence, there are several different family trees with that name that are otherwise unrelated to each other. I happen to descent from one of these families, now known as the “Strijen branch”. The earliest ancestor of this branch that can be traced back is Jacob Janse Hordijk, who was born around 1630 in the “Hoeksche Waard”, another island shaped by rivers, just south of IJsselmonde. Almost the entire family history then plays out on this other island, until my grandfather (Leendert Hordijk) moved elsewhere. A complete lineage is given at the end of this post. The area of the island of IJsselmonde where the Hordijk is located is now in the southern part of the city of Rotterdam. I managed to find some old pictures of the Hordijk in the city archives of Rotterdam. Click on any of the pictures below for a full-size view. 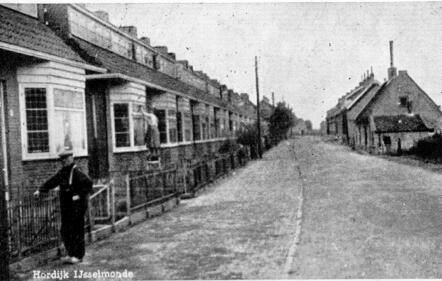 A view of part of the Hordijk from around 1930. Source: Stadsarchief Rotterdam. 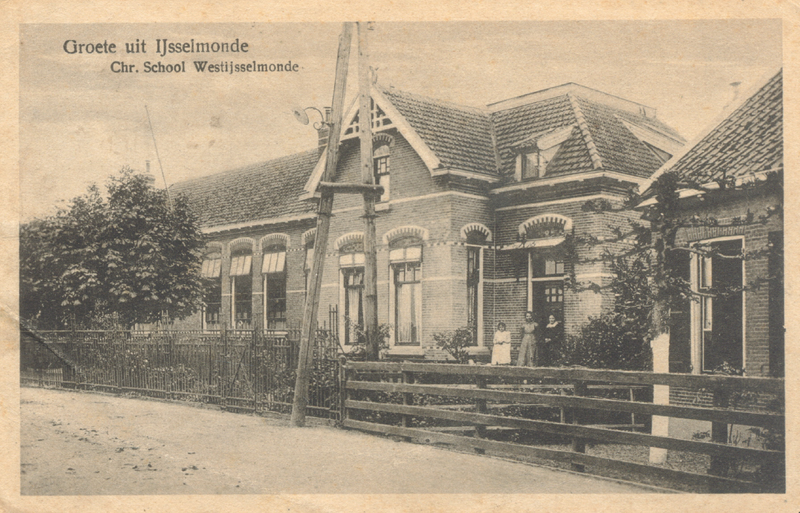 The Prinses Juliana School along the Hordijk, from around 1920. Source: Stadsarchief Rotterdam. Another view of the Hordijk, from just after WWII. Source: Stadsarchief Rotterdam. I recently visited the Hordijk, which still exists, myself. 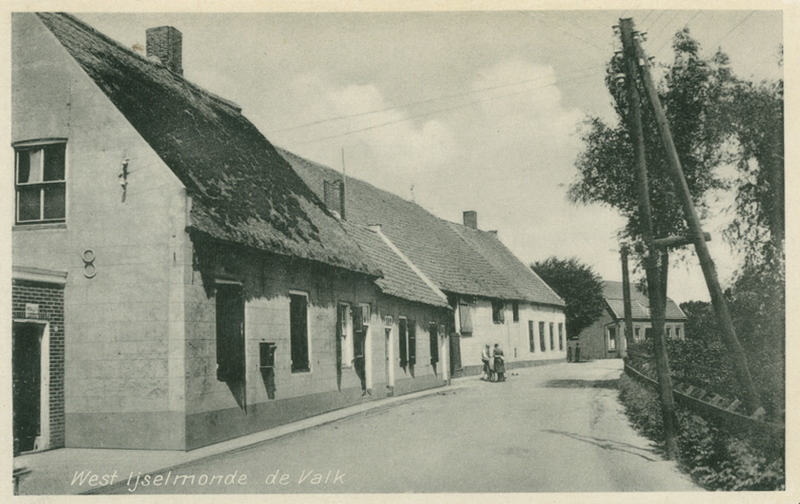 The narrow street running along the top of the small dyke is now lined with parked cars, and it is difficult to imagine what life here must have been like even 100 years ago, let alone several centuries ago. 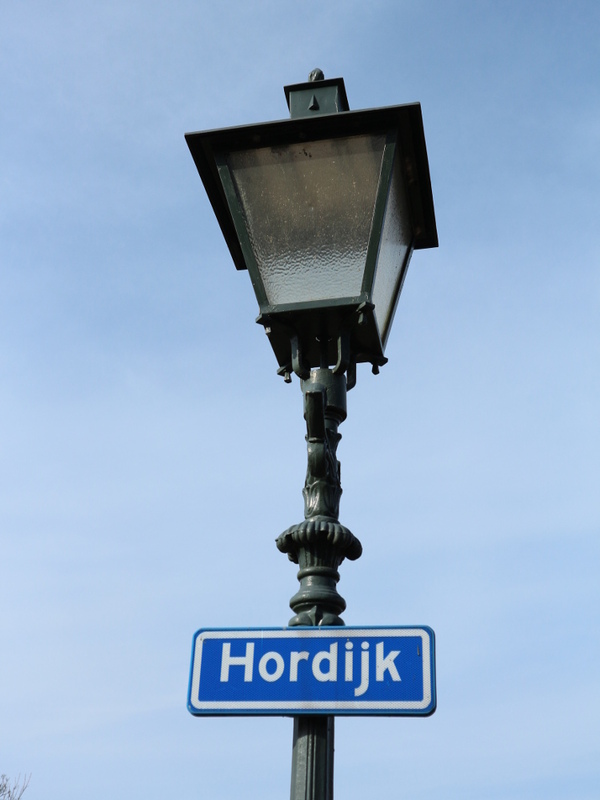 But still, it was nice to have a stroll along the Hordijk, knowing that my family name comes from this specific place. The street sign at the beginning of the dyke. The entrance to the Hordijk. 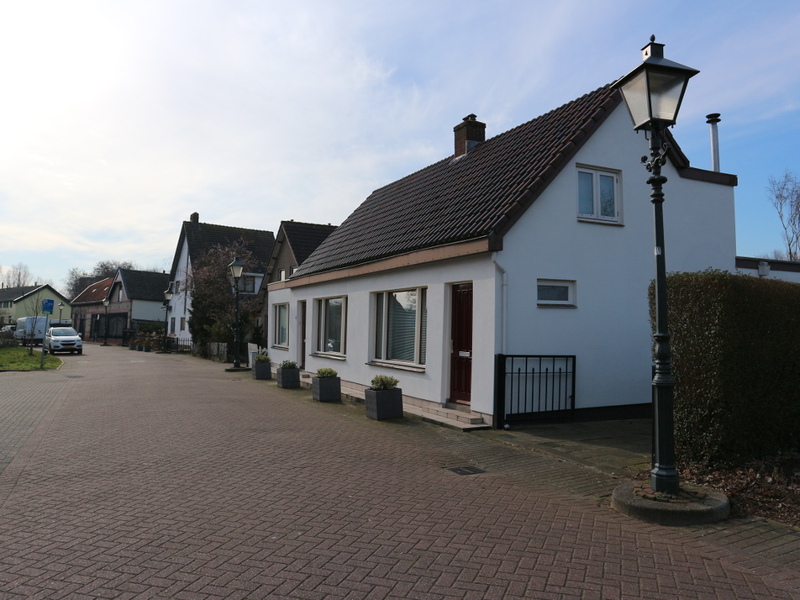 A cute old-style house at the other end of the Hordijk. 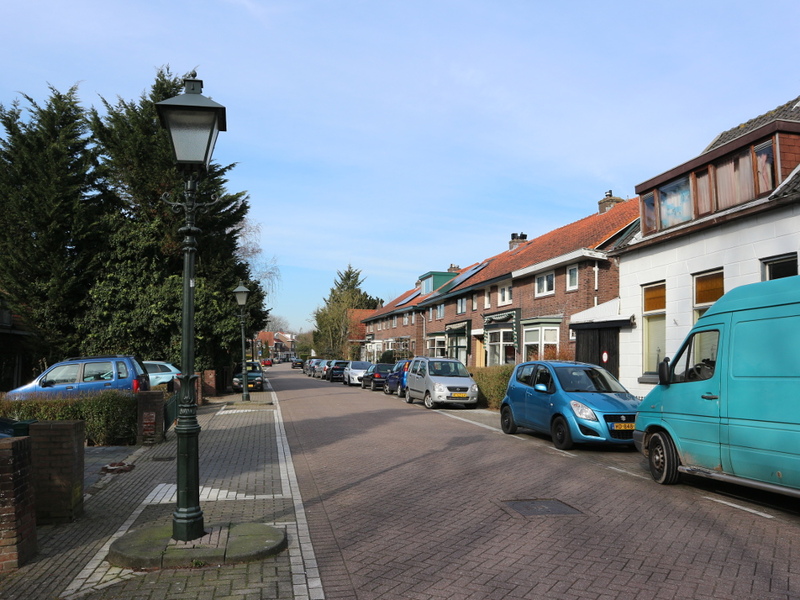 A typical view along the Hordijk. The complete lineage, from the earliest traceable Hordijk from the Strijen branch all the way down to myself, is given below. Each entry lists a name plus date & place of birth, and the name of the respective spouse. Source: genealogieonline.nl. Jacob Janse Hordijk (~1630, Nieuw-Beijerland) x Geertje Cornelisd. 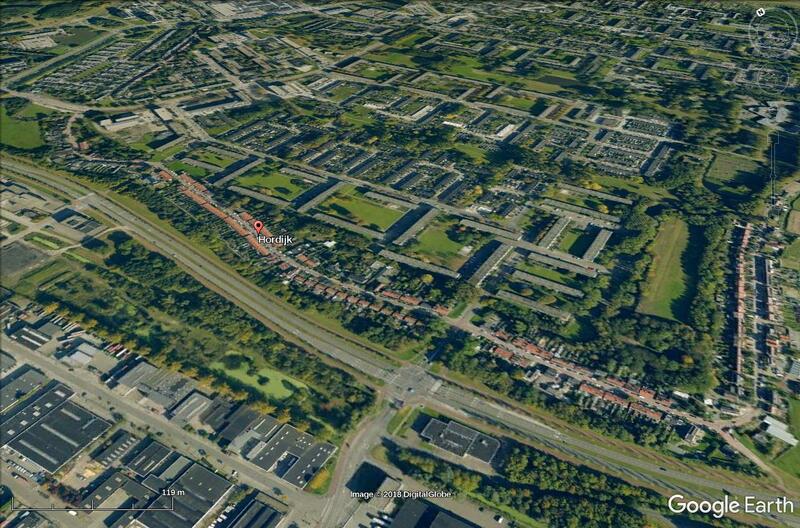 The Hordijk in IJsselmonde as seen on Google Earth (click the pic for a larger view). Unfortunately it is not known when the first Hordijk from our family branch actually started using that name, or when they moved away from IJsselmonde to the Hoeksche Waard (or maybe somewhere else first). But still, the origin of the name is clear, and the street/dyke is still there, even after 600 years or so. Quite fun to travel back in time this way!